Despite the amount of our money I spend on feeding my habit, Mrs CF has tended to be very supportive in my journey through the world of wine. She gets to benefit from it, of course: the more I know about wine the better the stuff I buy, and the better the stuff I buy the better the stuff she drinks. So we have walked hand in hand along this road, generally enjoying the same things along the way. We have discovered together the joys of Loire chenin, and roussanne from the Rhone, and a succession of new favourites which would have been unfamiliar to both of us just a few years ago. If I occasionally buy something I don’t like, she tends not to like it either, and if I love something, she tends to like it quite a lot as well. That’s how it works. And so I felt no particular concern when I poured her a glass of a new purchase I was excited about, Donnhoff’s Oberhauser Leistenberg riesling kabinett, 2009. It had perfect pedigree: Helmut Donnhoff is one of Germany’s great winemakers, king of the Nahe, beloved of, well, everybody. This, one of his most basic wines from a good vintage, got 93 points from Neal Martin, 17 points from Jancis Robinson, and to my mind is the perfect way to start to a warm evening. 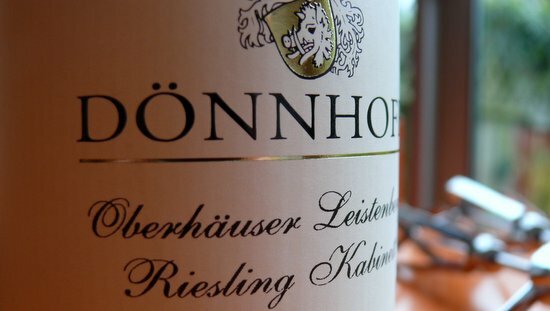 It’s lush and sweetish, but with riesling’s classic freshness, acidity and grapefruity zing. And at just 9% alcohol, you’re not going to regret it in the morning (unless what you really want is just to get ratted, in which case you should probably be drinking vodka). Mrs CF sniffed her glass. She looked at me suspiciously. She took a sip. “Urgh! It’s sweet!” she said, and demanded I open something else immediately. I’m determined to continue exploring German wine, but it looks like I’ll be doing it on my own. Isn’t that a bit like saying ‘Ugh, it’s white!’ and refusing to drink it? Also, you can’t smell sweetness! Jason, there strangely are people who do not like white wine. Or red. Or sweet. Or dry. I have met representatives of all these groups. In some cases it is because they have only tasted bad sweet (dry, white, etc.) wines, in other cases, well, I don’t know. Anyway, poor Mr Cellar Fella. If you fancy a wingman on the next tour of German wine duty, you know where to find me!